Americans remain widely opposed to U.S. military airstrikes in Syria, two new polls show, with voters skeptical of President Barack Obama's case for intervention. In a Pew Research poll released Tuesday, just 29 percent of Americans favored airstrikes “in response to reports that the Syrian government used chemical weapons,” with a near-majority 48 percent opposed. Wide majorities predicted negative consequences of a U.S. military intervention. Sixty-one percent said airstrikes were likely to lead to a long-term U.S. military commitment in Syria, and 74 percent said airstrikes would likely create a backlash against the U.S. and its allies in the region. 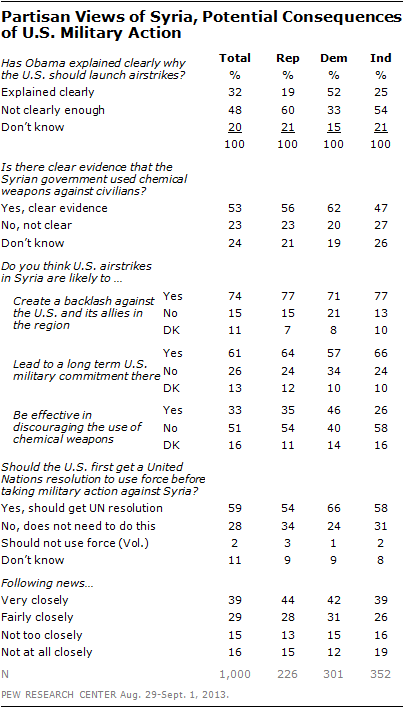 Just 33 percent thought airstrikes would be an effective deterrent against the use of chemical weapons. 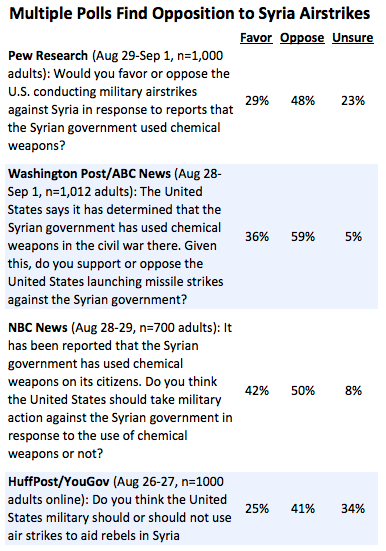 Not everyone polled was convinced that such weapons were used in Syria. While 53 percent said there was clear evidence that the Syrian government used chemical weapons against civilians, 23 percent said there was not, and another 24 percent were unsure. Only 32 percent said Obama had explained clearly why the U.S. should launch strikes. Back in March 2003, as the Iraq War started, 49 percent said that President George W. Bush had compellingly made his case for what was then at stake. In a Washington Post/ABC poll, also released Tuesday, respondents were told more definitively that “the United States says it has determined that the Syrian government has used chemical weapons in the civil war there.” That survey found fewer Americans undecided: 36 percent supported airstrikes and 59 percent opposed them. Americans were 10 points more likely to support the strikes if "other countries such as Great Britain and France participated," according to the Post/ABC survey. Britain’s parliament ruled out military action in Syria last week. The Pew poll surveyed 1,000 adults between Aug. 29 and Sept. 1, while the Post/ABC poll surveyed 1,012 adults between Aug. 28 and Sept. 1. Both used live interviews. The new polling highlights a muddled public reaction to a crisis that doesn’t fit neatly within traditional political lines. Partisan support for airstrikes has varied widely among surveys conducted thus far. In the Pew poll, Republicans were both more likely to support strikes and to distrust Obama’s ability to oversee them, while Democrats were simultaneously more dubious about military action and more likely to predict that any intervention would be effective. While no political group favored airstrikes against Syria, the GOP was somewhat more supportive. Thirty-five percent of Republicans backed airstrikes, compared to just 29 percent of Democrats. The numbers shifted, however, when Obama’s name was invoked. More than half of Democrats, but just 19 percent of Republicans, said the president has clearly explained why the U.S. should launch airstrikes against Syria. Democrats were also more likely to say there is clear evidence that the Syrian government used chemical weapons against civilians, and that airstrikes would be effective in discouraging the use of such weapons. They were somewhat less likely than Republicans to fear that strikes would create backlash against the U.S. in the region, or lead to a longterm military commitment. A HuffPost/YouGov poll released last week found similar results, with 36 percent of Republicans and 25 percent of Democrats supporting airstrikes. Democrats were also less skeptical of the consequences: They were 12 points less likely than Republicans to predict increased civilian casualties, and 13 points less likely to say airstrikes would be a first step toward sending U.S. troops to Syria. Other polling, however, showed a different breakdown. In the ABC/Post poll, Republicans and Democrats showed nearly identical support for the strikes, 43 percent to 42 percent. An NBC News poll also found more even support across party lines, with 46 percent of Democrats and 41 percent of Republicans supporting military action against Syria in response to the government's use of chemical weapons. Both parties were similarly likely to view the use of chemical weapons as a “red line” requiring a significant response. Obama's overall approval rating on foreign policy crossed into negative territory this spring for the first time in his presidency and has since continued to dip. Among Democrats, however, his numbers have remained positive. In a July McClatchy-Marist poll, 66 percent of Democrats, and 64 percent of self-identified liberals, approved of Obama's work on foreign policy. A July Quinnipiac poll gave the president a 71 percent foreign policy approval rating among Democrats.